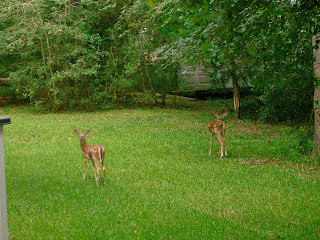 One of the greatest aspects to our neighborhood is the abundance of wildlife. We have numerous birds (including eagles and falcons), brown and black squirrels, turtles, raccoons, opossums, wild hogs, and deer. We've also seen a wolf in our back yard and spotted a fox around the house several times. The amount of deer in our neighborhood is staggering. Many people complain about them because they tend to eat their flowers and plants, but we really enjoy them. 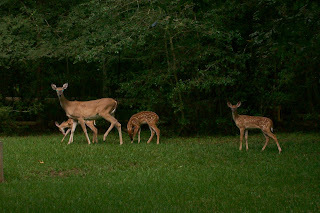 And this time of year there are many baby deer around. They are so precious with their little spots! 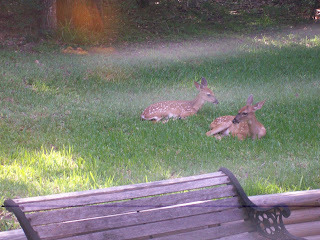 A mom and her babies have been spending a lot of time at our house. 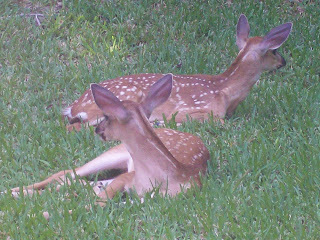 They come by almost every afternoon and rest in our back yard. We took a few pictures to share with all of you.